The Bharatiya Janata Party (BJP) president, Amit Shah, will arrive in Imphal (in Manipur) on Saturday and will hold back-to-back meetings with the leaders of the region barring Assam. According to media reports, Shah will hold the meetings to gear the party workers up for the 2019 Lok Sabha polls. 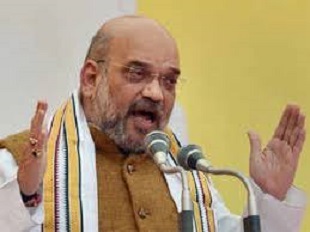 The saffron party is girding up its loins for next year’s general elections and Shah, who recently was on tour of Assam, came down heavily on the party’s social media team in the State for not being “aggressive” keeping the 2019 elections in mind. Shah asked the social media team to reach out to the electorate and the young crowd at large. The BJP president asked the party leaders in Assam to be active on social media and take a leaf out of the books of the Chief Minister, Sarbananda Sonowal, and the PWD Minister, Himanta Biswa Sarma, both of whom, he observed, were “very active” on social media platforms. The saffron party has also set a target of winning 21 seats out of 25 parliamentary constituencies in NE in the 2019 Lok Sabha polls. The BJP is pulling out all stops to win maximum seats in NE. Shah had earlier this year stated in a meeting in Guwahati, “Except Mizoram, all other States in NE are ruled by the North East Democratic Alliance (NEDA) constituents. So, all of you need to take it forward.” This factor has proved to be a big shot in the arm for the party. The BJP chief also said that the party will have to win the maximum number of seats in Northeast to “strengthen Prime Minister Narendra Modi so that development of the region continues”.